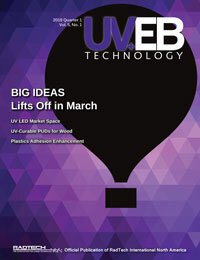 In recognition of the rapidly expanding development of new substrates (see, for example, UV Technology for Composite Finishing at RSW Distribution, Issue 4, 2016, www.uvebtech.com), RadTech is exploring the expansion of its wood-focused committee to include other applications. The group developed a list of possible target materials  including composites, plastics, fabrics and wood replacements  as well as applications not traditionally covered by RadTech, such as countertops, roofing, coil, appliances and textiles. It was decided to continue to scope out targets for RadTech and partners to help promote UV/EB technology. This new RadTech group formalized the development of an Applications Support membership category to include companies in areas such as fluid delivery, application equipment, conveying, controls, inspection, test, measurement, system integration, machine builders, and health and safety supplies and equipment. To qualify for this membership, a company may not compete with a regular RadTech member by offering UV- or EB-curable materials or UV or EB sources. Such companies may join RadTech as regular corporate members. The annual membership fee for an Applications Support Company was set at $800, which includes one individual; additional individuals may be added for $75 each. The group then entered into a wide-ranging discussion about the value proposition for UV/EB technology, including potential applications and partner events, as well as how to best advance the resource and regulatory benefits of UV/EB. A proposal to conduct a comprehensive, six-month durability study of UV/EB-curable materials (base resins and full systems) was presented to the committee, with funding and support from Ford Motor Co. and RadTech. The project would build a fundamental understanding of the durability of current, state-of-the-art UV/EB-curable resins, clearcoats and 3D-printed materials, with a focus on three independent systems: an exterior OEM clearcoat, an automotive interior component clearcoat and a structural resin for a 3D-printed component. Results will feed into a final paper and technical presentation to update both RadTech and the scientific community at large on how todays UV/EB-curable materials perform relative to the performance properties that OEM end users expect. Building on RadTechs relationship with UV/EB start-ups, the RadTech Board has approved funding for a unique UV/EB accelerator to engage students, start-ups and anyone with new ideas, concepts and prototypes for the technology. Those with ideas for new materials, optics, designs, printing, packaging, 3D printing, inkjet, building products, plastics, medical, electronics (and more) for UV/EB, visit www.radlaunch18.org for details and to apply for cash and travel grant prizes. RadTech members are encouraged to sponsor this initiative to receive recognition on the site and at RadTech 2018, serve on the selection committee and get two free tickets to  and recognition at  the RadTech 2018 awards dinner. Chen Wang, a materials scientist with Formlabs, Inc., in Somerville, Massachusetts, has been named as the newest member of the UV+EB Technology editorial board. Wang earned a doctorate in chemical engineering at the University of Colorado Boulder after receiving his bachelors and masters degrees in polymer chemistry at Beijing (China) University of Chemical Technology. He is a co-holder of one patent and a team member on a second application. He has presented at research seminars and numerous conferences, including the 2017 RadTech conference in Chicago. His work at Formlabs involves development of SLA 3D printing resins. At SGIA 2017, held October 10 in New Orleans, Louisiana, RadTech members offered a session on The Latest in UV Equipment, Inks & Trends, chaired by Howard Ragin, UV Specialties. The session offered expert insights on the rapid emergence of UV LEDs, including equipment, formulation and process control. 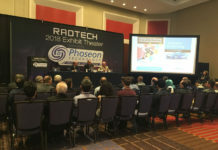 Threats from Hurricane Nate notwithstanding, more than 70 conference attendees joined the event, with RadTech panelists including David Biro, Sun Chemical; Mike Higgins, Phoseon Technologies; Jim Raymont, EIT Instrument Markets; and David Rose, Sakurai. Our SGIA audience had about 30 companies using UV technology already, and about half of those were running LED systems, said Ragin. LED systems were the focus of the lively question and answer session, including several questions about the durability of inks or coatings cured with LED vs. conventional lamps, particularly as related to outdoor exposure and color retention. Panelists detailed the differences between coating systems and how longer wavelength LEDs are excellent for penetrating inks and curing at the interface, but that in thicker applications and coatings applications  because the surface is inhibited by oxygen  LEDs are challenged to overcome this due to lack of shorter UV-C and UV-B wavelengths. However, formulations and advances in equipment are expected to cross this hurdle eventually.